Atlanta’s Mahek Dance Academy held its spectacular seventh annual dance recital at the 444 Theatre, Atlanta, Georgia on May 16, 2015. Dr. Harsheel Desai emceed the program of about fourteen engrossing dances, an imaginative mix of classical Bharatanatyam, contemporary Bollywood, fusion, and folk dances to popular Bollywood hit songs, conceptualized and choreographed by Academy’s founder and director Mahek Shah and performed with finesse by her, assistant dance teacher Aadithya Prem, and more than thirty of her Academy’s students of varying ages and diverse nationalities. Mahek and Aadithya began the recital with an elegant, blissful invocatory “Ganesh Stuti” dance which was greeted with rousing applause. This was followed by an uplifting, riveting Mallari Bharatanatyam dance, named after a musical composition played on the nagaswaram, a traditional Indian instrument. The music of Mallari is said to bring good luck and prosperity. 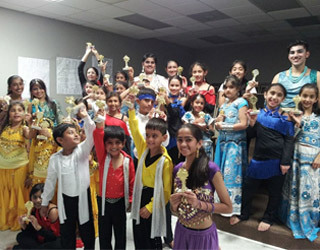 Dr.Desai said that many young students were performing for the first time and requested the audience to encourage and applaud their efforts to boost their morale and self-confidence. 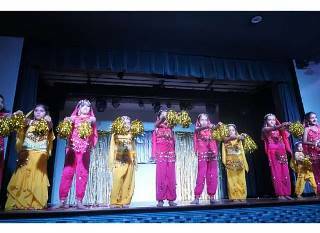 Preteens and teens with colorful pompoms performed a cheerful dance to the popular “Chance pe dance” song with Punjabi lyrics. In quick succession, students enthralled the audience with dances to favorite Bollywood songs like “Tune maari entriyaan,” “Manwa laage,” “Dhinka chikka,” “India Wale,” and “Radha Nachegi,” in multihued, shimmering costumes, facial and hair adornments, and jingling anklets, showcasing their dancing skills with well-coordinated and effortless moves, poise, youthful exuberance, and confidence, which had the audience tapping their feet and clapping along. In the vibrant dance to “Tu meri,” the dancers showed precise coordination in different moves and formations. At one point, the lights were dimmed and they created awesome colored patterns with LED lights. 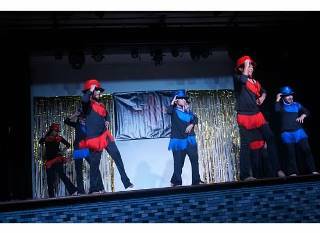 In another engaging dance to the song “Bang bang,” four dancers sported pink or blue hats. 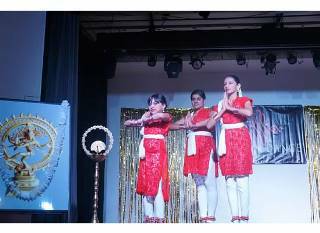 In the dance to the song “Chittiyaan kalaiyaan” with Punjabi and English lyrics, the Academy’s two senior students dazzled the audience with their energy, coordination, leaps and use of ribbons. The academy’s assistant dance teacher since 2009, Aadithya Prem is a young dancer of rare merit and dedication. Aadithya learned Bharatanatyam under Chitra T.B., a graduate of Rukmini Arundel’s school of dances, Kalakshetra. He charmed the audience with his bewitching elegance, sprightly movements, and expressive dancing combined with a powerful stage presence, in the dance to “Swaminatha paripalaya,” a traditional Carnatic music keerthana composed by Dikshitar. The song in Sanskrit is in raga Nattai and tala Adi. The version used for the dance was performed by a rock band, Haricharan with Bennet and the Band, and elicited wide applause. For the exuberant finale all the participants came on stage to dance to “Tharki chokro,” a Rajasthani song with catchy but funny lyrics. This dance had the enthusiastic audience tapping their feet and clapping their hands. At the beginning of the program, Dr. Desai had recounted Mahek’s passion for dancing from early age. Her family came to Tampa Bay, Florida in 1995, where she trained many students in diverse forms of dancing. Now in Atlanta, she runs dance academies in Smyrna and Duluth. During the interval, refreshments of samosas, chips, KitKat, and water bottles in a food pack were given to everyone. 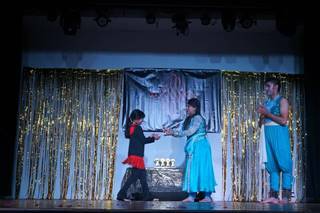 Finally, the stage lit up as Mahek, Aadithya, and the students proudly held their trophies and took a bow as the audience gave a thunderous ovation.